A neat, white and healthy set of teeth gives confidence to its owner. Stained teeth, on the other hand, might give the urge to hide the unwanted deterioration. We hardly open our mouths during talking, and the overall width of the smile decreases. In time, teeth discoloration might unfortunately result in self-evaluation problems. Treatment of stained teeth – what can you do? Bright teeth as a standard of beauty and good looks is not a fashion only of the 21st century. Ancient Romans held the ammonia in urine to have teeth bleaching properties. Ancient Egyptians manufactured a specific dental bleaching paste using the mixture of ground up pumice stone and wine vinegar. The first toothbrushes made out of hair appeared during the 17th century. These, apart from maintaining the whiteness of the teeth, also played a pivotal role in preventing teeth decay. During the 1800’s, dental practitioners discovered the connection between the discoloration, diseases and traumatic injuries of the teeth. Thanks to innovative procedures of the last 30 years, dental bleaching technology has rapidly advanced. There are a number of causes for teeth discoloration. We can distinguish between deterioration on the teeth surface caused by external factors and internal deterioration affecting teeth structure. You can choose from a range of tooth whitening procedures. Before you get started it is best to consult a professional who will check whether your teeth are suitable for whitening. It is advisable that your dentist monitors your teeth-whitening process to prevent accidents. 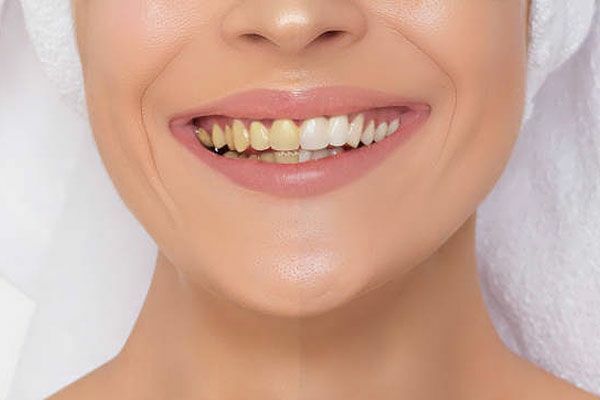 Tooth whitening cannot be carried out on patients with serious developmental disorders, patients who are allergic to any substance used for the procedure, in the case of sensitivity to light or in the case of mental instability. Patients must postpone tooth whitening treatments if they are pregnant or breastfeeding, or under conservative dental treatment. Mouthwash – use twice daily, before brushing teeth; swish for a full 60 seconds. Whitening intact teeth: the dental hygienist covers gums with protective substance, and then applies hydrogen peroxide or carbamide peroxide on the surface of teeth to be treated. Then exposes teeth to a special laser light. Treatments usually take 30-90 minutes and an average of 1-3 treatments are necessary for the best results. It is worth considering the following advice to make sure you have a bright smile even if you still want to enjoy a cup of coffee every morning.